To be around cute girls wearing cute clothing is all Eruna Ichinomiya desires. Since Mikagura High School happens to have the cutest uniforms around, she decides to enroll in this prestigious high school known for its cultural clubs. However, she does not realize that joining a club is mandatory, and representatives from each club must battle for a ranking. Based on these rankings, club members are awarded housing and food. Chasing after Seisa Mikagura, the most beautiful girl in school, Eruna joins the going-home club but finds herself thrust into fighting the next club battle. With the other club representatives wielding unique powers, the competition is sure to be fierce! 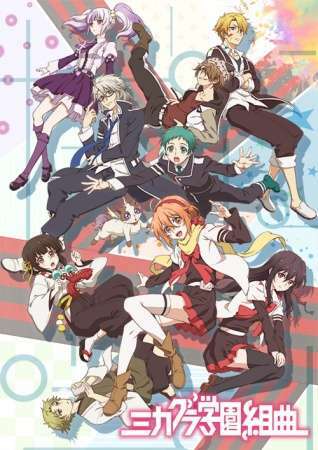 Based on the popular song series, Mikagura Gakuen Kumikyoku follows Eruna as she explores the various clubs in school and assists the members with their troubled lives, all of whom are also vying for the top spot in school.